In The New Jim Crow, author Michelle Alexander meticulously crafts the argument that black Americans have been disproportionately targeted by the once widely advertised War on Drugs. The result has been a massive growth in America's prison population, largely composed of black men, many of whom have spent years in prison for relatively minor drug crimes which would go unnoticed in much of the country. Further compounding the injustice is the fact that upon release from prison, the label of felon (often forced upon "criminals" through plea deals) makes reentry into society amazingly difficult, as discrimination against felons in the arenas of housing and employment is perfectly legal. The ultimate outcome has been the decimation of America's inner cities, with fatherless families being all too common and standard stereotypes being unfairly reinforced. Remarkably, when citizens are asked about the most pressing issues facing our cities, criminal justice reform hardly makes the cut. In Rochester, we unfortunately have a firsthand look at the hopelessness that can affect urban America. Our local conversation mirrors the national conversation, with an immense amount of coverage focused on education, employment, transportation, and crime. Relatively speaking, criminal justice reform receives far less attention. Yet the reality that drug use in Pittsford is not treated nearly the same as drug use in the city of Rochester cannot be denied. And the subsequent consequences to our community as a whole are equally undeniable. Does our media really need to provide intense coverage of every crime committed in the city of Rochester, often supporting preconceived notions and thus affecting how we direct our community's resources? Can our media at a minimum spend an equal amount of time on criminal justice reform as it spends on crime itself? As discussed many times previously, part of Rochester's charm is found in its tendency toward self-deprecation. But as also mentioned several times, Rochesterians often find themselves on a slippery slope between humorous self-deprecation and damaging self-hatred. This latter entity is defined by the feeling that our problems are unique (i.e. no other city in the world could possibly have the same issues.) This thought process clouds our local dialogue on many issues such as poverty, crime, education, transportation, etc. Recently, the Democrat and Chronicle published an interesting article on the role of transportation (or lack thereof) in maintaining urban poverty. 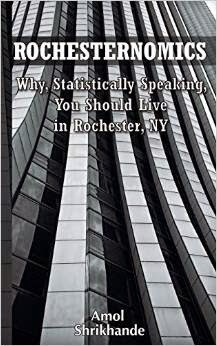 The article addresses the important fact that Rochester has an overrepresentation of public transportation commutes greater than one hour (one way), markedly penalizing those living in or near poverty. The author addresses the irony of this quandary in a region that prides itself on short commutes. The fitting conclusion of the piece is that the location of jobs and public transportation infrastructure both need to improve. Yet prior to taking the next step and concluding how horrible Rochester is compared to other cities, it is worth looking at public transportation statistics in relative terms rather than absolute terms. Exactly how does Rochester compare to other locations with regards to public transit commute times? In Rochester, as per the Census Bureau's 2014 one-year American Community Survey, the average commute time for transit users was 40.2 minutes. This transit commute time happened to be lower than that in San Francisco, Chicago, New York City, Jersey City, Philadelphia, Oakland, Portland (OR), Newark (NJ), Denver, Honolulu, Los Angeles, Baltimore, Santa Ana (CA), Houston, and Cleveland. What do these 15 cities have in common? They were recently ranked among the top 25 best cities for public transportation.